Sauropoda are an infraorder of saurischian ("lizard-hipped") dinosaurs. Sauropods were herbivorous (plant-eating) long-necked, and quadruped (four-legged). They first appear in the fossil record during the late Triassic, around 230 million years ago. They include the largest animals to have ever lived on land. Along with all other dinosaurs (except for birds), they became extinct 65 million years ago. 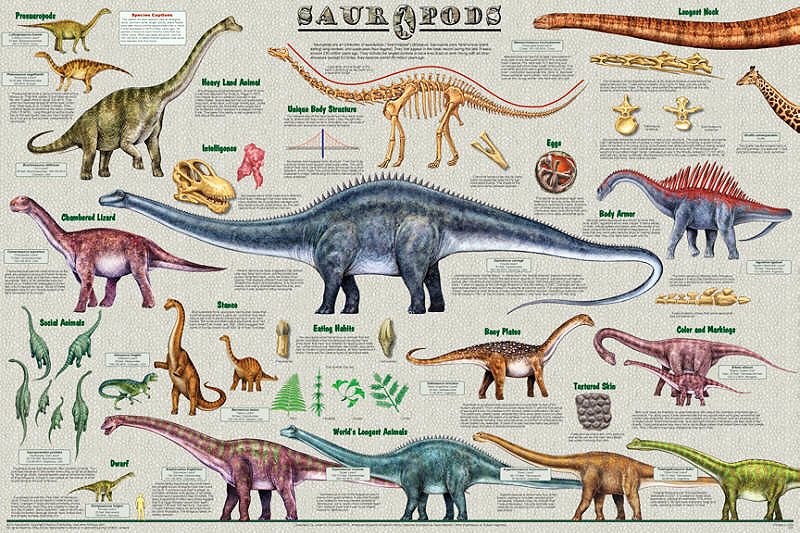 This exciting new posters shows all the largest species. Some were close to 200 feet long - the length of four school buses. Also shown are some of the more unique species. Mamenchisaurus had 31 foot long neck that comprised half of the body length of the animal. Camarasaurus vertebrae were hollowed out or riddled with passages and cavities, which inspired its name, "Chambered Lizard." The unique body structure of these fascinating animals is explored. Could they rear upright like a horse. Other interesting topics are intelligence, teeth and diet, eggs, skin texture and social behavior. Created with the help and cooperation of the American Museum of Natural History.